Straight-talking CrossFit trainers reveal why they believe the tough-love approach is best when it comes to coaching. Andréa Maria Cecil reports. Although soft-spoken, Jeff Martin is known for being a straightforward coach at his affiliate, CrossFit Brand X in Ramona, Calif. And while he says his style has mostly yielded positive results, it hasn’t always resonated with every member. One of the last members with whom CrossFit Brand X parted ended up creating a Facebook group called “I Hate Jeff Martin.” But Martin believes not mincing words has had a positive effect on the vast majority of the affiliate’s membership, and he said it’s important for trainers and coaches to help athletes understand that they’re being straightforward because they want them to improve. “When did we get so soft that telling an adult that they need to push their knees out needs to be qualified with, ‘You have really cool socks on today’?” he said. 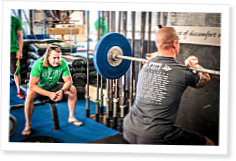 CrossFit coaches detail their successful and unsuccessful programming experiments in the search for measurable, observable and repeatable results. Many trainers avoid addressing the topic of nutrition with clients. Top CrossFit coaches think that’s a mistake and explain how and why they broach the subject with athletes. I believe some boxes and coaches are forgetting what cf is all about, functional fitness,when we lose site of helping make a person a better athlete and focus on being liked or bringing more people in the doors we are doing a disservice to the crossfit brand. Coaches are trained by the best if the best, there is no excuse other than greed and laziness, if a client is doing it wrong correct, and correct them immediately, no need to sugar coat anything, it is for there safety, if you cannot correct in a Normal setting then do it one on one and if that doesn't work crossfit lite, and if that doesn't work the reality is that crossfit may not be for them and to protect there health and the reputation of the crossfit brand you must let them go, not continue taking there monthly fee, bottomline! I think coach said many years ago, in a clip I can't find, and I paraphrase horribly, that he's a master of negativity when it comes to training. Look for what's wrong, and fix it immediately. Thank you for reading, Josh! I think this article brings up a good point of building an environment which asks people to be better, but more importantly be open to being better. But i disagree with it. It seems that many Crossfit Trainers call themselves coaches while forgetting that coaching is about nurturing and enabling. A coaches first job is to fully understand an athlete, Then to apply an appropriate stimulus to improve the athletes. Best Question Chip could have asked was "Hey Girl(an endearing phrase i've coined with all my female clients, which helps them mentally cue themselves for a criticism), How much lower do you think you can get?" Our first job as Trainers and Coaches is to enable, and its basic human nature to prefer to "save face". Being in an environment which is all about improvement doesn't mean that become intolerant of ignorance, but rather nurture and address the flaws in someone as you become aware of them... but first become aware of them.